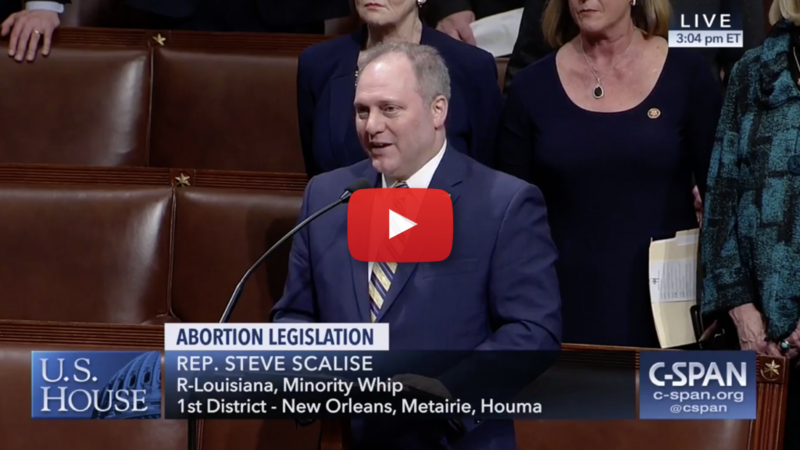 WASHINGTON, D.C.— In front of the full House Chamber, House Republican Whip Steve Scalise (R-La.) asked for unanimous consent to bring Rep. Ann Wagner’s (R-Mo.) Born Alive Survivors Protection Act to the floor today. Democrats refused to even consider the request and provided no explanation for their objection. Democrats need to explain to the American people why they will not protect innocent babies born alive after a failed abortion from being killed. This follows Whip Scalise’s introduction yesterday of a resolution providing for floor consideration of the Born Alive legislation. After 30 legislative days, Whip Scalise will file a discharge petition that would force a vote in the U.S. House of Representatives upon being signed by a majority of members of the House. Click here or on the image above to watch his remarks.